DraftKings Millionaire Maker: Are High Salary Players Worth It? There a quite a few top dollar plays this week on DraftKings that are tempting to use: Aaron Rodgers vs New Orleans, DeMarco Murray vs Washington, and Matt Forte vs New England to name a few. But if you add one of these players to your lineup this week, you’ll find that they eat up a lot of your salary space, significantly handicapping your ability to use all the players that you want. It’s a big trade-off, and the question is, are playing these high salary players worth it? One way to answer this question is to look at how to solve the most glaring problem with high salary players, how do we offset their high cost and prevent them from eating up all of our salary cap? The answer is simple: we must balance out our lineup by pairing a high salary player with a min salary one. 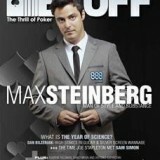 But we have to remember that when making a lineup for the Millionaire Maker, we cannot have any player with low upside. If one of our players is only producing 10-15 points at best, we will almost never get 1st. So while having a min salary player score 12 points on DraftKings would far exceed that player’s salary, it hurts us. In the end, the min salary players we pair with our high salary players must have good upside in order to compete with other ways we can spend our salary. Let’s examine the two player combos we can make with mid salary players, and the two player combos we can make with Matt Forte and a min salary player. Next to the player, I’ll list their best game so far this season as a way to determine upside. Below are the two of the better combos I could produce. Keep in mind that Patterson has been absolutely terrible aside from his week 1 game. So not only does the Matt Forte combo have worse upside than the Ellington-Maclin combo, it’s much riskier. I tried looking for better min salary options than Patterson, but they were hard to find. Justin Hunter is $3,100, but he couldn’t muster more than 1 reception against the terrible Redskins secondary last week. We could gamble on Anthony Dixon or Bryce Brown, but they have a bad matchup vs the Jets stout run D, and who knows which player will get more opportunities. Bishop Sankey is an option, but doesn’t do enough in the passing game to have big upside. There simply aren’t any good min salary options to pair Forte with to make him worth it. However, there may be another way to fit Forte (or Murray) this week, and that’s by saving at the QB position. Just with any player, we need to make sure our low salary QB has high enough upside so he doesn’t kill our chances of winning. Looking at the QB options this week, there are a few that pop out. Ben Roethlisberger is only $5,800 on DraftKings, and clearly has the upside against the Colts we’re looking for. Andy Dalton as well, especially if AJ Green comes back, will have to pass a lot against the stout Ravens run D, and probably has 25 point upside. 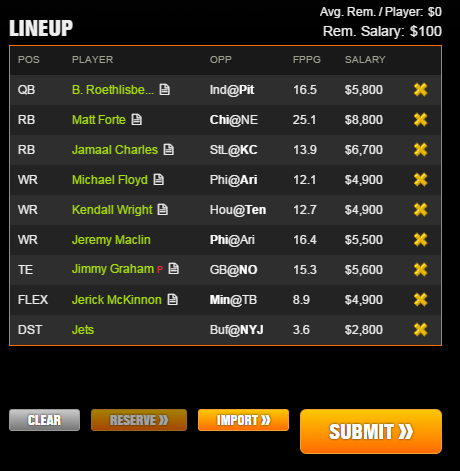 I tried making a sample lineup with Roethlisberger and Forte, and the results were not bad. Clearly, if we save at QB this week, we can produce a solid lineup. That being said, I found myself struggling to use all the players I wanted. And, I couldn’t afford to pair Roethlisberger with Antonio Brown, which is an important but not totally necessary move when constructing a tournament lineup. Looking at the above lineup it seems viable to use Forte; this lineup certainly has the potential to win. The other question is: can we fit in a high-salary QB like Rodgers? Given the lack of low salary position plays, my assumption was it would be really tough. Here’s my shot at a good Rodgers lineup. Again, I was restricted here. I couldn’t quite afford Jordy Nelson to pair with Rodgers and even without using Nelson, my lineup leaves a lot to be desired. Another thing to consider is that QBs in general have lower upside than position players because of DraftKings PPR format. Rodgers has had some big games this season, but his best game produced 32 fantasy points. Matt Forte on the other hand has produced a 38 point game, and Foster a 34 point game. Demarco Murray’s best game was about 32 points, but he clearly has crazy upside. Clearly, using Rodgers more restrictive than Forte, Murray, or Foster, and without as much upside, what’s the point in using him? Sometimes, there are enough low salary plays to justify using several high salary players. In week 5, one could have happily used Khiry Robinson and Louis Murphy (both min salary players) and done well enough to win the Millionaire Maker. But this Sunday there just aren’t good min salary options, which means using a top dollar play is going to seriously handcuff your ability to pick all the players you want. 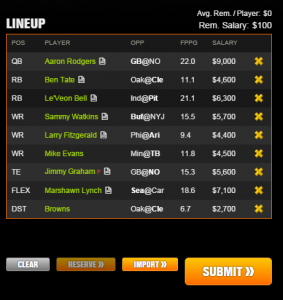 A lineup with Forte or Murray could end up winning it all, but I think using too much of them will cost you. DraftKings Millionaire Maker is running for a 4th straight week. 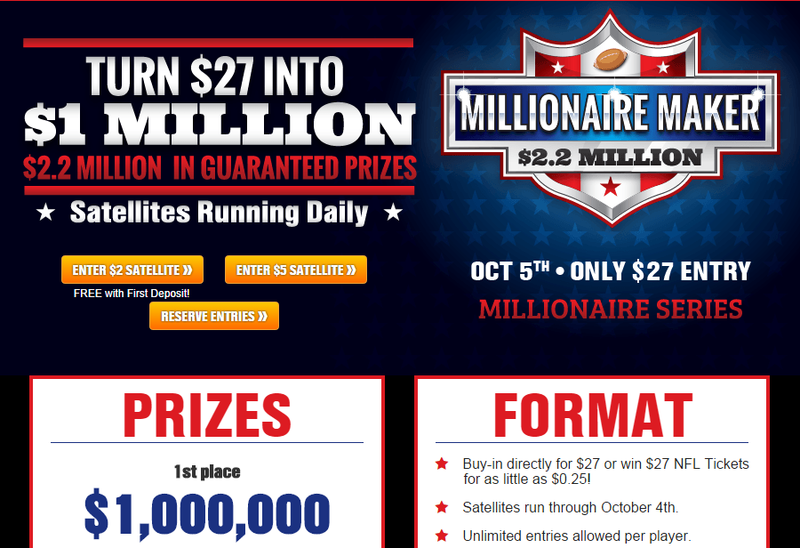 For only $27, you can have a chance to win $1,000,000! With a likely overlay, the value of this tournament is massive. Sign up using this link to receive a 100% deposit bonus up to $600!